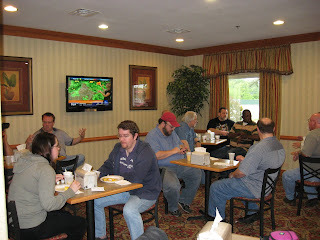 Sunday, May 15th was the final day of Pulp Ark 2011, and as had become our want each morning, we wound up partaking of the continental breakfast at the hotel together. There were only two panels that day. Ron Fortier moderated a panel featuring the members of the Pulp Factory who were present and the convention to discuss why the current/new interest in pulp, followed by Art Sippo discussing his work featuring Doc Savage's German counterpart Sun'Koh. 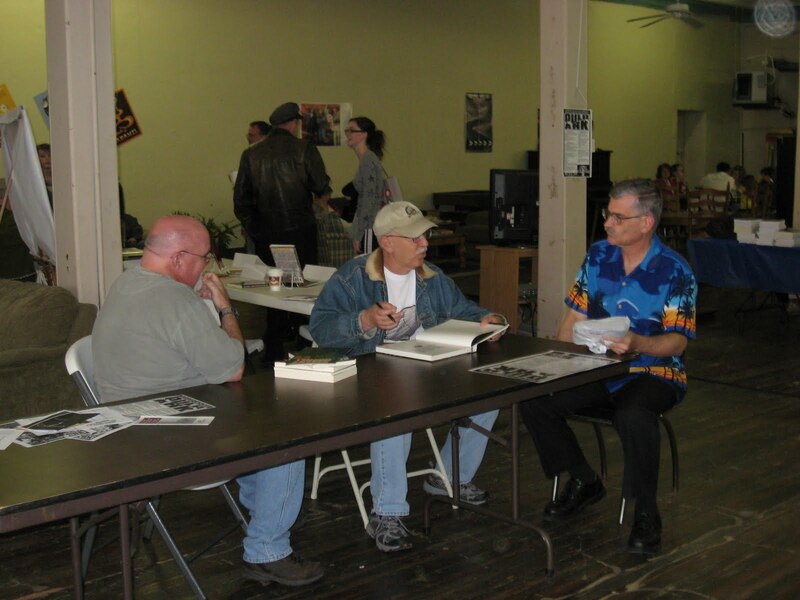 Unfortunately, I do not have photos of those two events because I stayed at the Pro Se table meeting fans and signing authographs, as well as collecting a few from the people I knew as a fan before officially becoming a professionally published author. Then the Pulp Ark Players presented the final act to the original production "The Case of the Bloody Pulp". 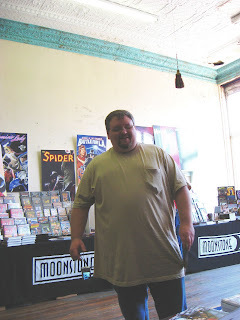 As previously mentioned, all the panels were recorded by Ric Croxton and Art Sippo of The Book Cave and can be found at http://thebookcave.libsyn.com/. The last hurrah, Sunday night. Then sadly, we all started to say our goodbyes and part company. 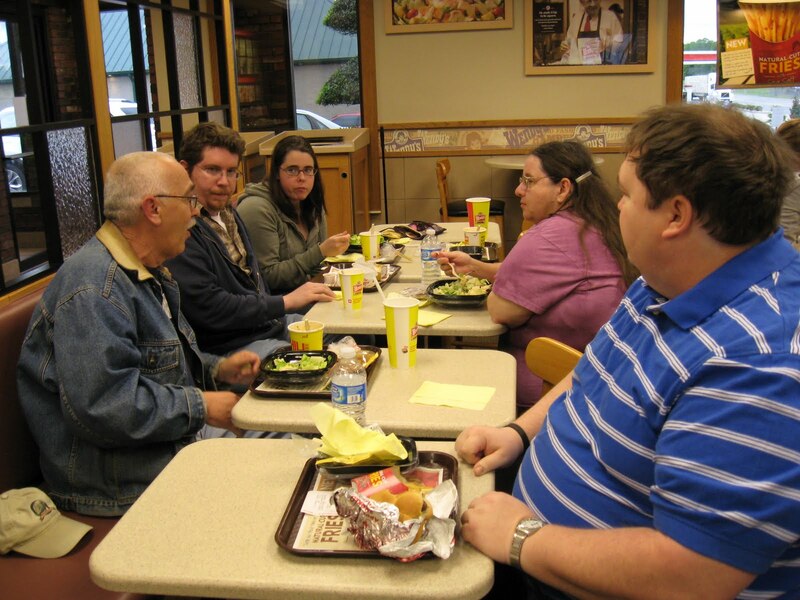 But while most went off by Sunday night, there were a few stragglers who did not have a flight until Monday morning, so we had one last hurrah at the local outlet of a fast food franchise. Pictured, starting at the left, are Ron Fortier, Ken Janssens, his fiance Christina O'Connor, Nancy Hansen, and myself. The return trip Monday was a real hassle, but that is soley the fault of Delta Airlines, and not anyone connected with Pulp Ark. Now, to close out my report, I would like to post a few photos I took over the course of the convention that were not germaine to the first four installments of this thread. Overall, it was an interesting experience for my first convention appearance as a professional/guest and not in attendance as a fan. I like to think I was on my best behavior the whole time, but in the end the all I can say for sure is that I at least tried to be. It was hard to control my excitement. I think I used up a decade's worth of adrenaline in one weekend, getting to meet a lot of people who before then I only knew by their work. Each night I was always tired but too excited to sleep. Yet this was also an opportunity for people who rarely got the chance to meet in person to just kick back and relax and catch up on things. Here on the left you can see Ric Croxton, Ron Fortier, and Robert Kennedy doing just that. 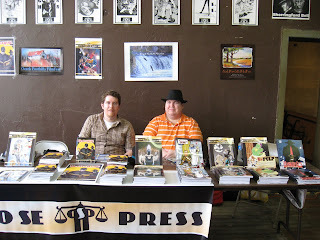 Here I am with author Derrick Ferguson. Despite the hat, I'm the short one. 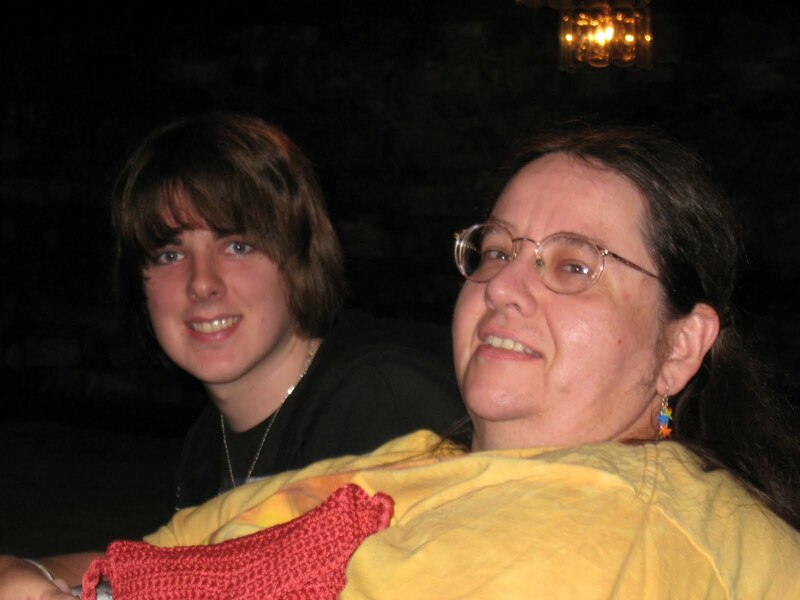 Author Nancy Hansen got to meet artist Daulton Carpenter, who illustrated her story "Masquerra and the Storm Lord" for Fantasy and Fear # 2. She did buy the art at the auction Saturday night, but as of this posting, has yet to receive it. 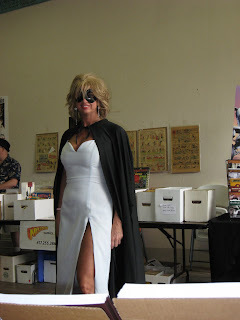 Besides the debut of the mysterious Pulptress, another femme fatale of the Pulp world, The Domino Lady, was at Pulp Ark over the convention weekend. But in the end, out of all the memories I have of the first Pulp Ark convention, the photo on the left represents the one I treasure most. I first 'met' Ken Janssens over the Internet when I was editing for the umpteenth start up company that never got off the ground that I somehow always wound up working for. Despite how good his work was, for Ken had submitted a comic book script for the first Sherringford Bell story "Studying Scarlett". 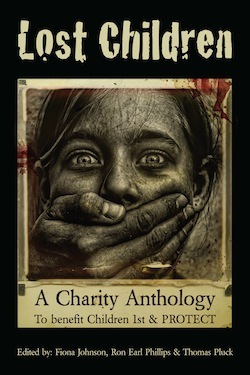 The prose version wound up in the second issue of Pro Se Press' Fantasy and Fear magazine that I had the honor of editing. While things didn't work out for either of us at the start up, Ken was nice enough to recommend me to Pro Se. I auditioned, and as they say, the rest is history. Ken and his fiance Christina O'Connor came all the way from CANADA to attend the convention, thus not only making this his first professional appearance in America, but his first professional appearance anywhere. 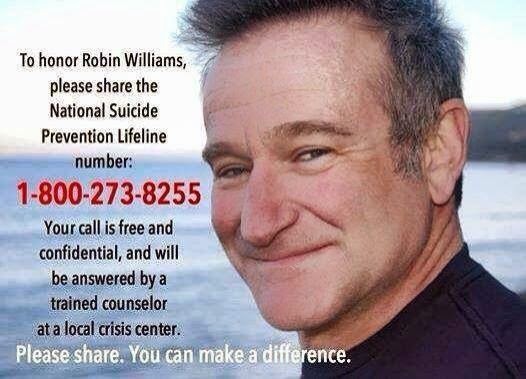 They are also two of the nicest people you could ever hope to meet. For me, just getting to say hello and thank you to him in person was more than I could ever hope for. I'm greatly looking forward to seeing them and everyone else again at PULP ARK TWO in 2012! Thus ends the Pulp Ark 2011 report. 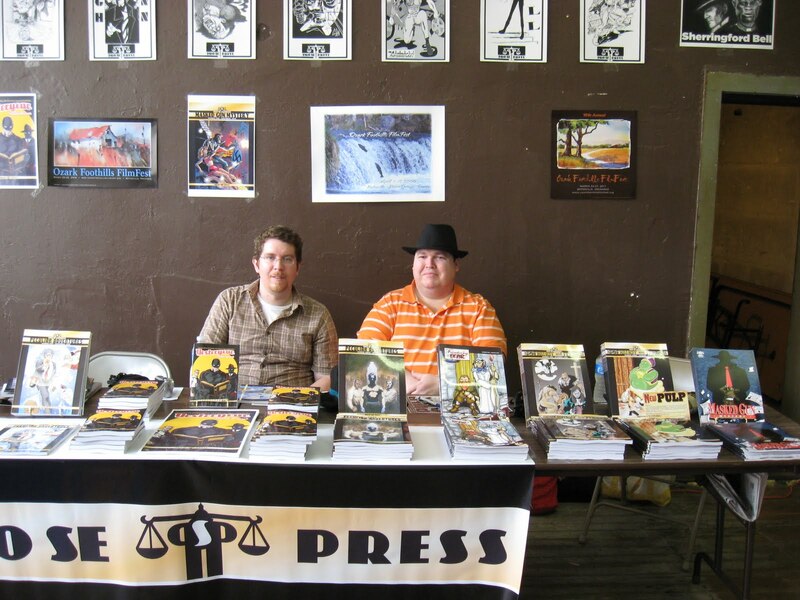 I would also like to thank Tommy Hancock and Fuller Bumpers for not only originating and inviting me to the convention, but for starting Pro Se Press and giving me a chance to express myself as an author in the pulp world.